Size: 58 x 32 x 6 cm. 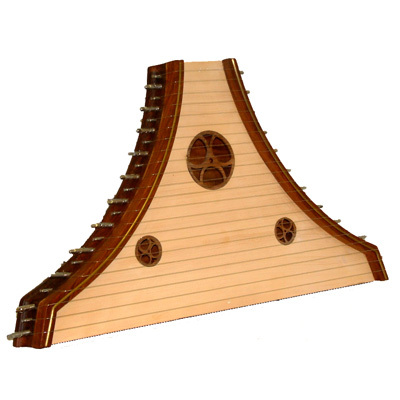 The psaltery, taken from the Greek word “Psalterion”, probably filtered into Europe from the Near East during the crusades. From the 12th century onwards there are many illustrations showing the instrument in different forms but the most common was the trapezoidal shape with curved sides, often referred to as 'pigsnout'. The plucked psaltery is played either by resting on the lap or leaning against the chest and plucked either with fingers or with a quill. Newly designed, bright sounding and easy to play plucked 'bull nosed' psaltery strung in steel. Supplied with a tuning key and carrying bag. 22 Strings, Tuning: g a b c d e f# g a b c d e f# g a b c d e f# g.